Ham is usually the rear part of the carcass of a pig, calf, sheep. There is also a shoulder ham. This part of the neck, shoulder and forearm of the animal. Especially popular among Housewives are pork. Dishes are delicious, appetizing in appearance, and the cooking process is quite affordable in home conditions. There are many variations of this dish. Someone bakes the ham in foil, someone cuts off the fat, and someone - no. To make the ham added flavor, marinate and create a beautiful glazed crust use different herbs and spices honey and brown sugar, cinnamon and cloves, ginger and allspice. The following recipe will allow even inexperienced Housewives to juicy meat with a thin crispy crust. Two days before cooking the ham should marinate. You can use a simple classic way is to RUB the ham with salt and black pepper, cover the entire surface of rings of fresh onion, wrap in plastic wrap or foil and put into the refrigerator. Around the same time, it should be put in the freezer a piece of bacon. Before cooking the ham, you need to wash, clean and cut into long wedges smooth few medium-sized carrots. Bacon removed from the freezer and slice same as carrot. Some Housewives also bacon ham garlic, but not everyone likes that meat around it during baking may be a little green and purchase a light metallic aftertaste. The meat is narrow and long knife make longitudinal incisions in these "pockets" put the carrots and bacon. Useful for spehovanie a special needle, but it is not at all. Lard ham need to quickly because the fat is rapidly thawed, and then becomes softer and it would be virtually impossible to put in "pockets". Preheat the oven to 180 degrees Celsius. On a pre-greased pan put the ham, cover with foil and bake. The time required for roasting will determine the rate of one hour for every kilogram of meat. If you have a special thermometer for meat, then wait until it shows 140 degrees Fahrenheit or 60 Celsius. For fifteen or twenty minutes to complete you need to remove the meat with foil and grease it. This is done to obtain a beautiful glossy crust. In principle, the smearing there are hundreds of options. Will fit any tart jam, plum, blackcurrant, cranberry and mustard, the same sour Apple juice and honey, honey and cinnamon, apricot jam and dried ginger. Choose, focusing on your taste, experiment and find your signature combination of spices. Once the ham is ready, remove it from the oven and cover with foil again. In any case, do not rush to cut it! So you will achieve that it immediately drained all the juice and meat will become dry. Wait 20 minutes and then proceed. A ham is good as main dish and as a cold appetizer. 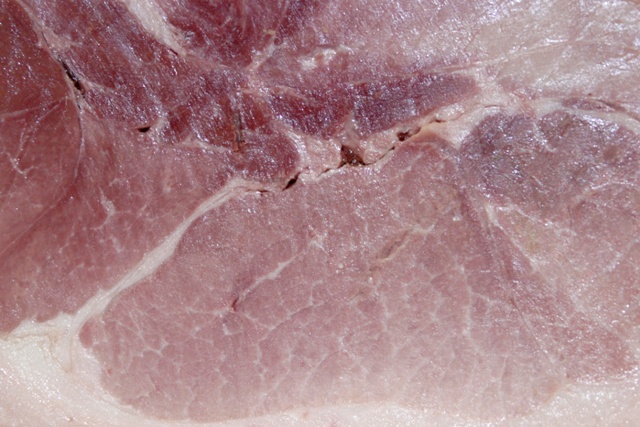 If your ham was from a bone, don't discard it after eat all the meat. You can make great broth.